Each of the remaining Victorian villas on Preston Park Avenue is tremendously charming and would make a dream home for most of us. Some have been demolished though and most converted. In the case of No. 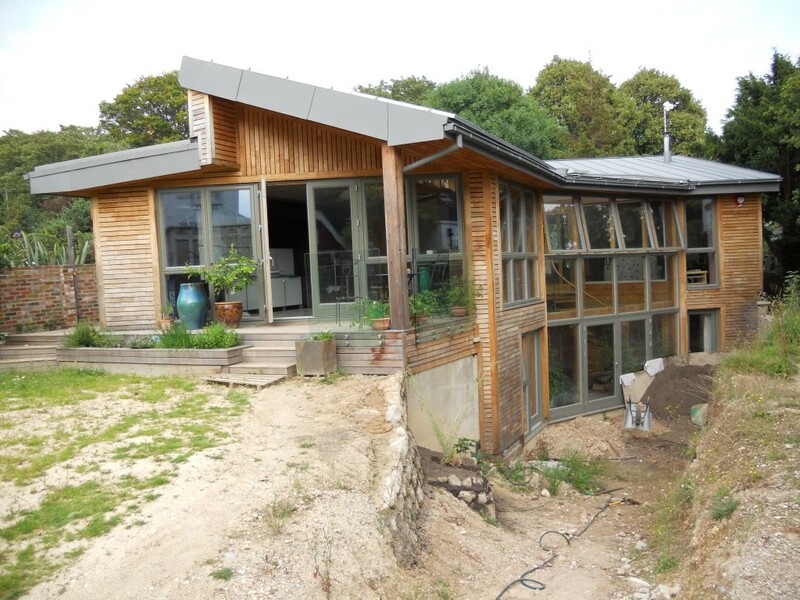 5, its garden is now home to a new building, an incredible eco dwelling called Yew Tree House. The timber-clad structure is the home of Mick and Sue Paskins whose drive to make the zero carbon dream into reality was totally evident upon my arrival when I was shown the myriad of delicacies being grown around the garden. I couldn’t write everything down quickly enough but I noted strawberries, raspberries, blackberries, courgettes, green beans, Brussels sprouts, parsnips, carrots, leeks, potatoes, asparagus, thyme, rhubarb and lettuce during my tour of the axe-shaped garden. Had I been hungry, I probably wouldn’t have actually made it inside. Immediately obvious about the building is the amount of wood that is proudly on display throughout. 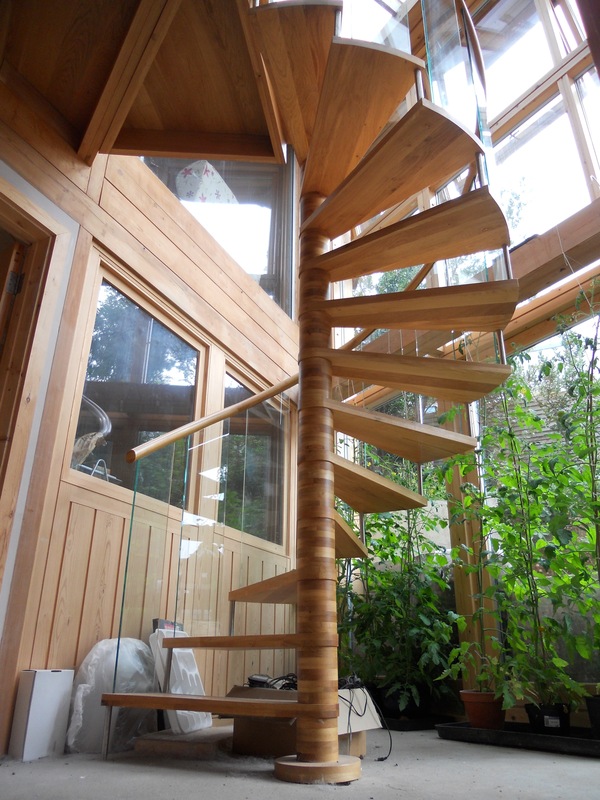 The cladding is coppiced sweet chestnut, a material of which I am a huge fan already; the exterior doors and windows are pine; the glulam beams that hold the building up are larch; and the spiral staircase is oak. Most fascinating of all is a tiny metal plaque at the back of the garden which indicates that the bench to which it is attached is made out of teak from HMS Thunderer, the famous dreadnought. The house was designed by Bill Dunster from ZEDfactory, the architect behind the groundbreaking BedZED development in Hackbridge, London. It is no surprise, therefore, that Yew Tree House has a sedum roof, a 5,000l rainwater tank under the patio, fifteen photovoltaic cells on the roof and a wood burner in the lounge. Solar thermal panels heat the water so effectively that the boiler has been turned off since the end of March. Alongside the obvious eco features, I was particularly impressed by the custom-made recycled glass work surface in the kitchen which has no joints, and also the sets of internal sash windows and shutters downstairs between the master bedroom and stairwell. They are all environmentally-friendly – and each looks great too. Yew Tree House is part of a small but growing group of eco buildings around Brighton & Hove that I have fallen in love with which includes the Earthship and 15 Lloyd Close. Getting such projects through planning must be tough but I can certainly see the attraction.